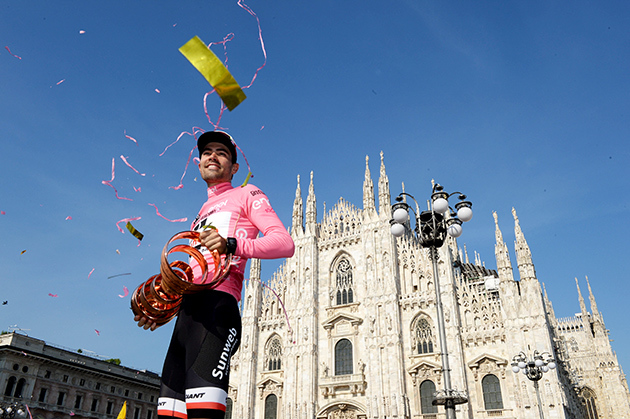 Tom Dumoulin turned in a great time trial that made him the winner of the 100th Giro d'Italia. Weather in Milano, Italy at 2:30 PM, local time: 29C (85F), sunny with the wind from the SSE at 8 km/hr (5 mph). No rain is forecast. The race: At 5:40 AM Pacific time ten riders have finished with Zhandos Bizhigitov (Astana) posting the best time at 38min 49sec. The riders start at one-minute intervals until the final 15 (in GC order), who are spaced three minutes apart. Nairo Quintana is scheduled to start at 4:46 PM, local time. 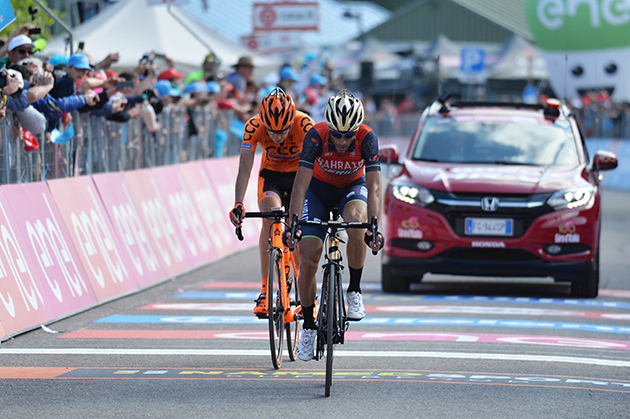 With so many rivals within one minute of each other and Tom Dumoulin just 53 seconds away from the Maglia Rosa, today was a day where every second counted. After a powerful start with speeds reaching nearly 60km/h, Tom clocked in at Villa Reale in a time of 10 minutes and 20 seconds. 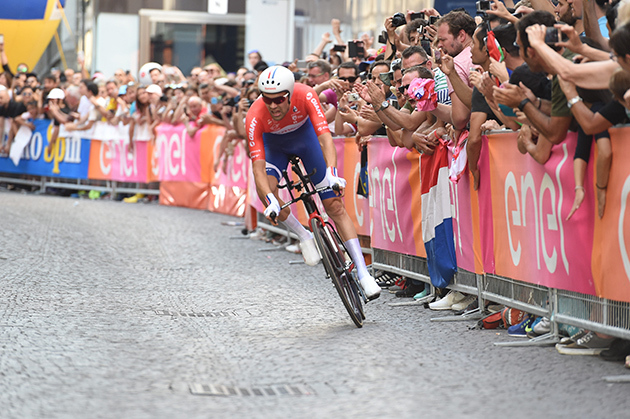 With the race to pink well and truly on, the Dutch time trial champion made it look easy as he perfectly manoeuvred around the course, reaching the second time check in 20 minutes and 9 seconds. After this check in, Tom was the virtual race leader but with no idea of his time or the race’s virtual standings Tom kept up the pace through to the finish in Piazza Duomo. Tom stopped the clock with a time of 33 minutes and 23 seconds, and faced an intense few minutes awaiting his fate. After a thrilling few minutes, Tom’s victory was sealed. 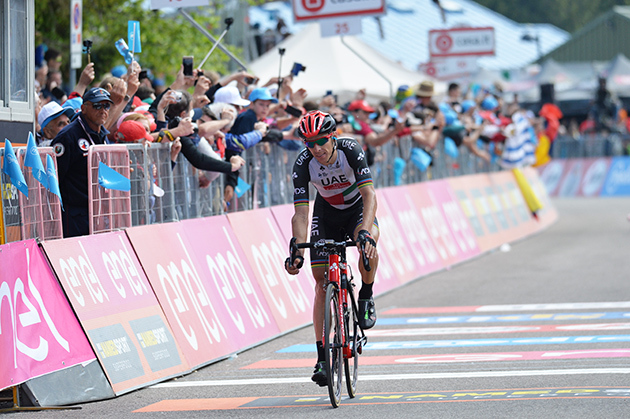 He wins the Giro d’Italia by 31 seconds, marking both his and Team Sunweb’s first Grand Tour general classification victory. 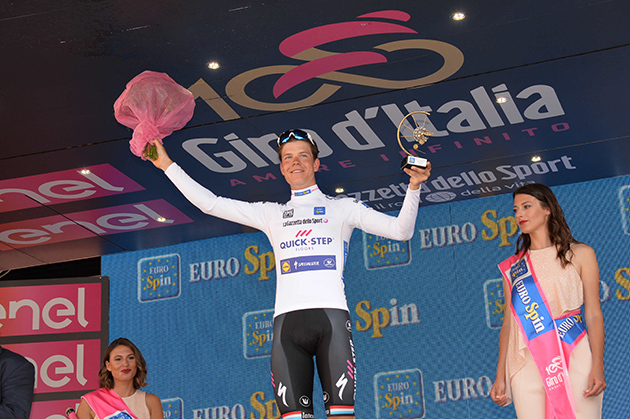 Jos van Emden time trialled to victory in the final stage of Giro d'Italia today in Milan. Van Emden finished next to the famous Duomo in 30-08 minutes. Team LottoNL-Jumbo's time trialist beat the Giro winner Tom Dumoulin by 15 seconds. "I'm the happiest man on earth," said Jos van Emden. "I am so happy that I can finally win after all my second places. I have been sitting on the hot seat for a long time and most times, someone else was faster. Finally, I’m the one who can shout how happy I am." According to Van Emden, he had a good time trial and Dumoulin was his biggest opponent. "I saw at the first intermediate point that I was two seconds faster and at the second intermediate point, I was six seconds faster. I won by four seconds in the second part, while that was my strongest part." Dumoulin lost more time on Van Emden and eventually the Dutchman of LottoNL-Jumbo was 15 seconds faster than Dumoulin. 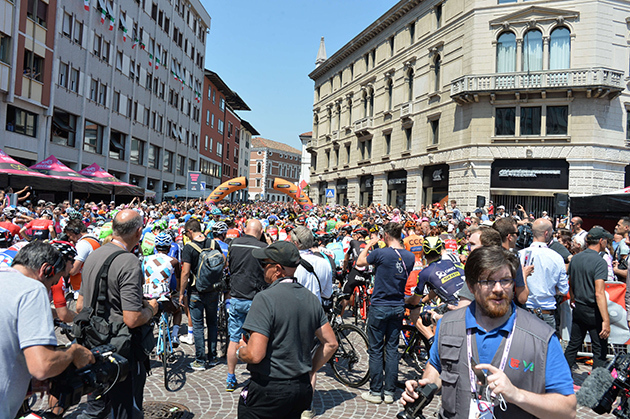 The time trial started on Monza's circuit and finished 29.3 kilometres later in central Milan. With an average speed of more than 53 kilometres per hour, Van Emden proves that it was a course for specialists. On his Italian Bianchi Aquila CV, the mechanics mounted a larger front chain ring. "I rode a 58-tooth outer ring today and in the back, I had an 11. It even occurred a few times that I wanted to switch even lower but I was already on the 11. Then you know the speed is good." The time trial is an important specialty not only for Jos van Emden. Team LottoNL-Jumbo proves this year again that they made a step ahead in time trials. Van Emden took the team’s fourth time trial victory of the season. Thinking specifically for the time trials, Team LottoNL-Jumbo made its bikes, clothes and helmets as aerodynamic as possible in cooperation with Bianchi, Shimano and Lazer. 12 PEDERSEN Mads TREK-SEGAFREDO s.t. 14 LUDVIGSSON Tobias FDJ s.t. 24 GONÇALVES Jose' KATUSHA-ALPECIN s.t. 26 VENTOSO Francisco BMC s.t. 34 ROY Jérémy FDJ s.t. 35 SANCHEZ Luis Leon ASTANA s.t. 38 BELKOV Maxim KATUSHA-ALPECIN s.t. 43 CATALDO Dario ASTANA s.t. 44 LANDA MEANA Mikel SKY s.t. 52 MARCATO Marco UAE TEAM EMIRATES s.t. 60 KEISSE Iljo QUICK-STEP FLOORS s.t. 64 RAVASI Edward UAE TEAM EMIRATES s.t. 65 VERONA Carlos ORICA-SCOTT s.t. 68 BOARO Manuele BAHRAIN-MERIDA s.t. 69 GASTAUER Ben AG2R LA MONDIALE s.t. 72 DE LA PARTE Victor MOVISTAR s.t. 75 TCATEVICH Aleksei GAZPROM-RUSVELO s.t. 79 ROJAS Jose MOVISTAR s.t. 92 ROVNY Ivan GAZPROM-RUSVELO s.t. 93 HOFLAND Moreno LOTTO SOUDAL s.t. 98 PETILLI Simone UAE TEAM EMIRATES s.t. 99 SUTHERLAND Rory MOVISTAR s.t. 101 BILBAO LOPEZ Pello ASTANA s.t. 103 KOZONTCHUK Dmitriy GAZPROM-RUSVELO s.t. 104 WOODS Michael CANNONDALE-DRAPAC s.t. 110 ANTON Igor DIMENSION DATA s.t. 112 HIRT Jan CCC SPRANDI POLKOWICE s.t. 114 SLAGTER Tom-Jelte CANNONDALE-DRAPAC s.t. 117 MARTINELLI Davide QUICK-STEP FLOORS s.t. 119 MEZGEC Luka ORICA-SCOTT s.t. 127 HANSEN Adam LOTTO SOUDAL s.t. 128 LOSADA Alberto KATUSHA-ALPECIN s.t. 137 BERHANE Natnael DIMENSION DATA s.t. 147 TIRALONGO Paolo ASTANA s.t. Jos van Emden finishes his stage-winning ride. 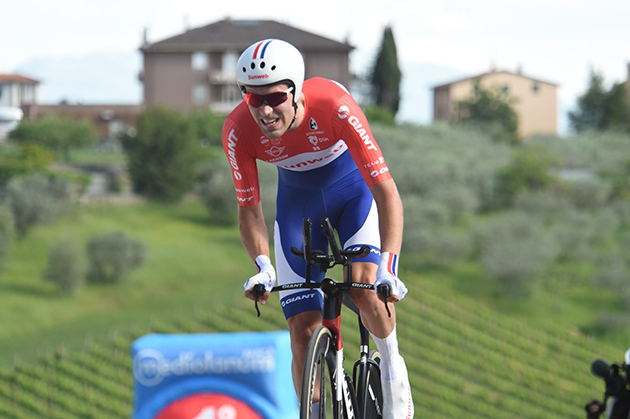 Tom Dumoulin heads for the finish. 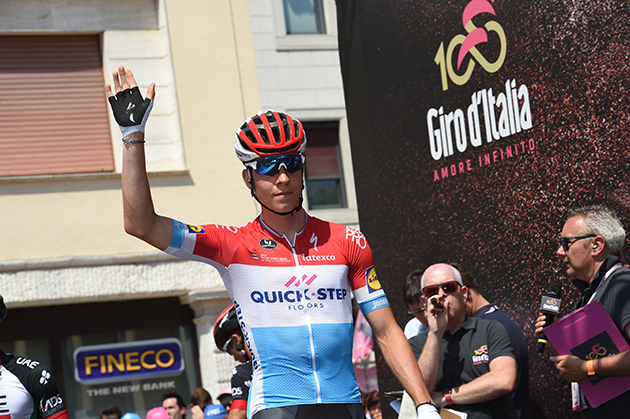 His second-place in the stage is good enough to give him the final Giro overall win. 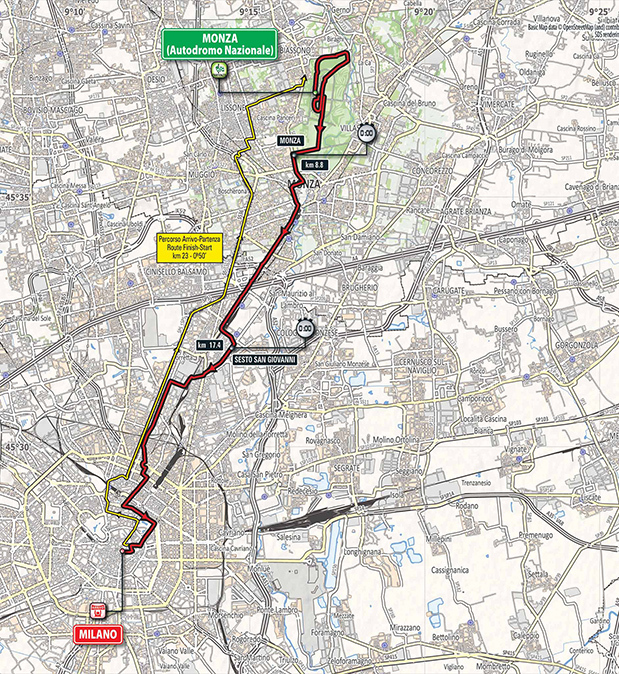 Organizer's preview: The Individual Time is perfectly flat (or very slightly downhill) and runs along the boulevards in Monza and Milan after the start in Monza Motor Racing Track (one complete lap is raced). 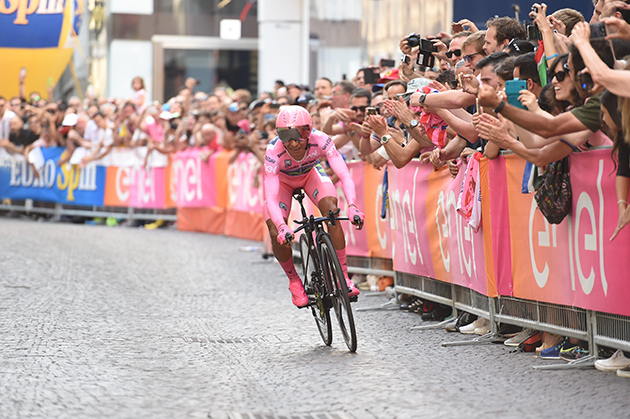 A “classic” finale in the city where the Giro d’Italia was born with the finish line in Piazza Duomo. 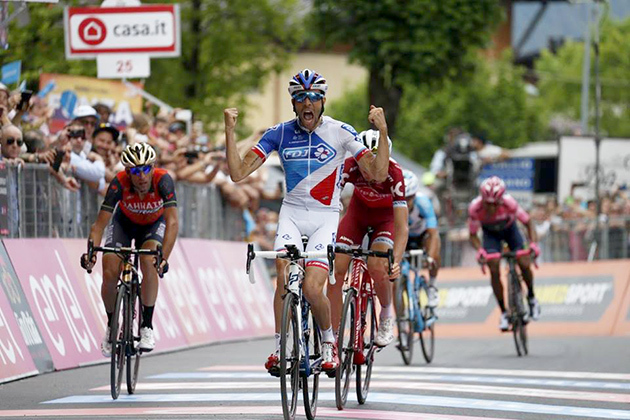 Thibaut Pinot wins stage 20. Weather at the finish city of Asiago at 1:30 PM, local time: 19C (67F), partly cloudy with the wind from the south at 11 km/hr (7 mph). No rain is forecast. Looks like a nice day for a bicycle race. The race: 163 riders started today's stage at 12:08 PM. LottoNL-Jumbo rider Steven Kruijswijk, beset with stomach troubles, did not start. Late in the stage, struggling, Giovanni Visconti abandoned. 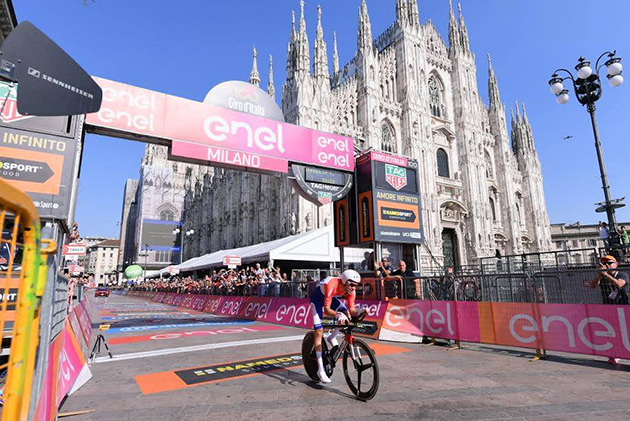 The 2017 Giro d'Italia will be closer than ever with the decisive 29.3km ITT from Monza to Milan on Sunday. 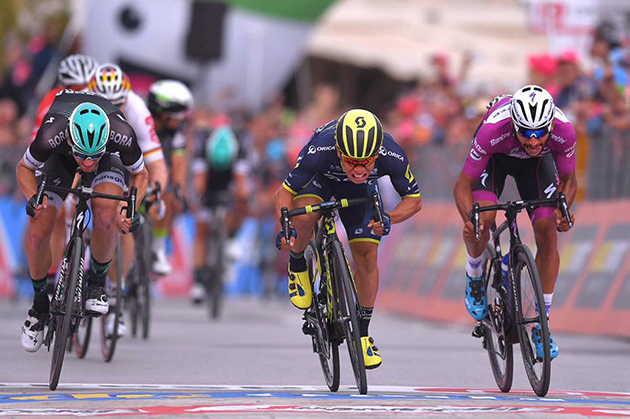 Nairo Quintana and the whole Movistar Team fought as hard as they've done over the three weeks of racing to keep improving their position at the Italian grandtour's final mountain stage -190km from Pordenone to Asiago, including the grueling climbs of Grappa (Cat-1) and Foza (Cat-1)- and took a few seconds on Tom Dumoulin (SUN), their strongest rival for a time trial where the 'Cóndor' will leave everything on the road to try and win the race against most odds. Well covered by his seven team-mates until the foot of the first climb, the Boyacá-born cyclist found sensational support from Víctor de la Parte and Andrey Amador through most of the day's uphill sections. 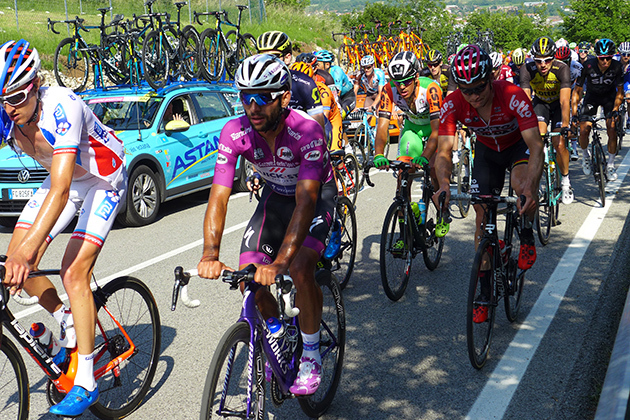 The two kept the pace lively through many parts of the Grappa; kept him away from trouble at the subsequent descent; and picked up the pace from the foot of Foza to even cover an initial acceleration from Nibali (TBM), which only the GC contenders could eventually match. 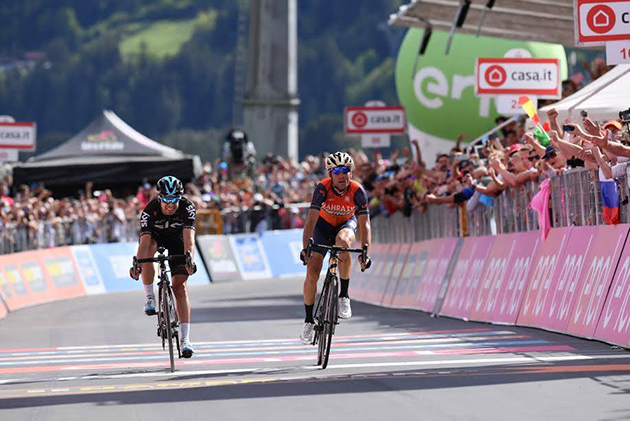 The 'Shark' and Nairo went ahead together with 7km from the top of the ascent, seeking for a previous move from Pozzovivo (ALM) and Zakarin (KAT), and later joined by Pinot (FDJ), the trio tried to break the pace of Dumoulin, who always remained at a few seconds' distance. 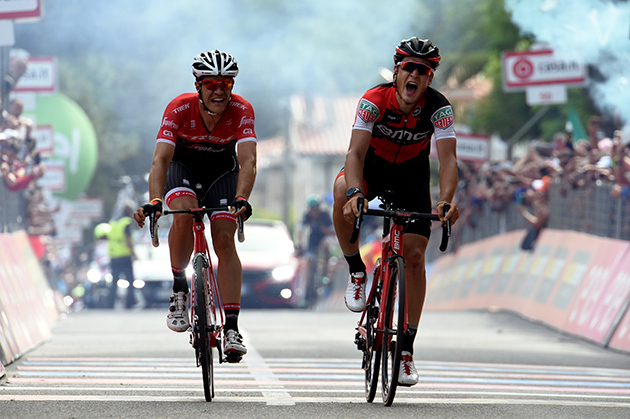 Following a fast few kilometers immediately after the summit, which saw the pursuit trio making their margin grow up to 30" on Dumoulin, Jungels (QST), Mollema (TFS) and Yates (ORS), the junction between the first two groups broke cooperation inside the front and boosted the stragglers' chances. In the end, only 15" separated the five-man lead, with Pinot victorious and Nairo in 5th, and the second group. The gaps for the TT thus remain really short: 39" for Quintana over Nibali; 43" on Pinot; 53" to Dumoulin; 1'15" against Zakarin; and 1'30" over Pozzovivo. A one-on-one fight that will decide the fate of all contenders after three weeks of exhausting efforts. Nairo Quintana: “Better in this place than behind! (smiles) We tried everything and this is what we got. It's difficult in such situations to try and convince the whole group to work as hard as you in the finale, even if everyone inside that move was equally interested on pushing. The only important thing now is that we've got the Maglia Rosa, which was our initial goal heading into the final TT - though we'd of course have liked to enjoy a bigger margin - and we'll give our best tomorrow with what's left. "Many times in a three-week stage race, you're made of pure suffering, even if it doesn't look so from the outside. It's really difficult to either attack or defend yourself against top-quality riders. It was such a difficult day for me. Once we got ahead of the Dumoulin group I pushed with all that I had, trying to open a gap on him because he's the biggest candidate for the win tomorrow. I wasn't really thinking about the sprint, the day's win or the bonus seconds, but just on distancing him as much as I could. He also had some people taking turns behind and the gap got quite smaller than we initially built after the top of the climb. 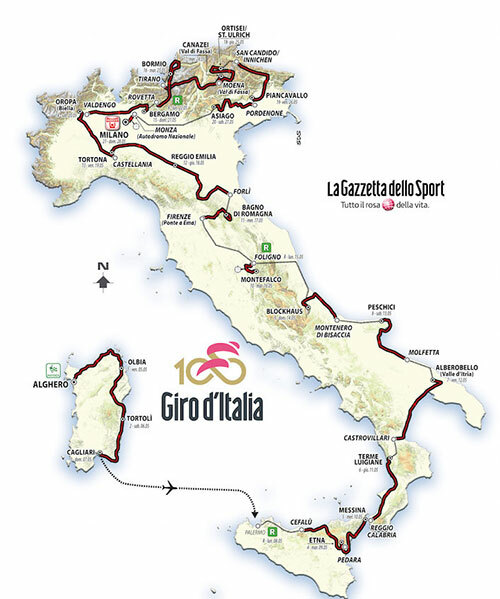 "Sunday's TT will be much different to the first one in this Giro. It's a pan-flat course, perfectly suited for specialists. I just hope to defend myself well. We haven't got that much time on our rivals, but sometimes things turn out well for me on such courses, and obviously, I'll do my best. The physical condition seems to be level within us, and I feel like gaps won't be really big. Dumoulin is the most dangerous rival, and Nibali and Pinot also do well on TTs. However, should things go just normal tomorrow, I shouldn't lose too much time. I also rely on fatigue: after 20 days of grueling racing in this Giro, I should stand a little more of a chance against them." 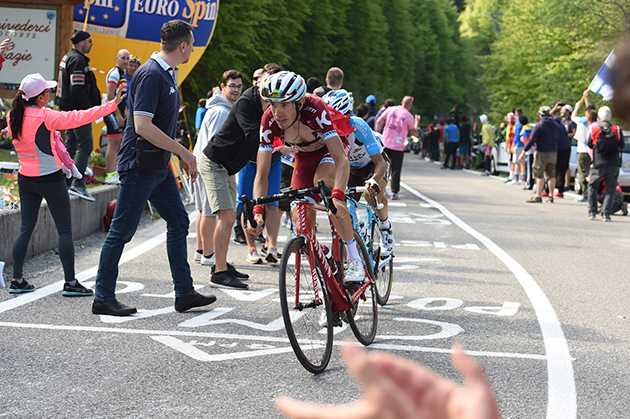 2 ZAKARIN Ilnur KATUSHA-ALPECIN s.t. 3 NIBALI Vincenzo BAHRAIN-MERIDA s.t. 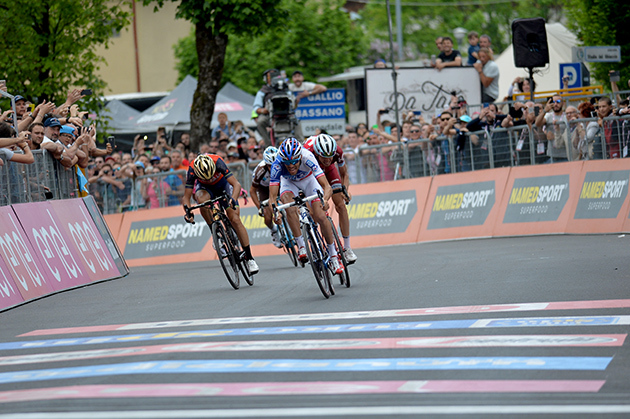 4 POZZOVIVO Domenico AG2R LA MONDIALE s.t. 5 QUINTANA Nairo MOVISTAR s.t. 7 YATES Adam ORICA-SCOTT s.t. 8 REICHENBACH Sébastien FDJ s.t. 9 MOLLEMA Bauke TREK-SEGAFREDO s.t. 10 DUMOULIN Tom TEAM SUNWEB s.t. 13 FRAILE Omar DIMENSION DATA s.t. 14 DUPONT Hubert AG2R LA MONDIALE s.t. 15 POLANC Jan UAE TEAM EMIRATES s.t. 16 DEIGNAN Philip SKY s.t. 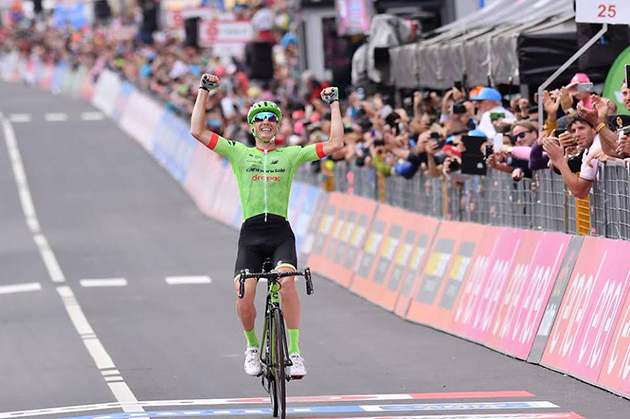 19 FORMOLO Davide CANNONDALE-DRAPAC s.t. 20 CATALDO Dario ASTANA s.t. 21 MENDES Jose' BORA-HANSGROHE s.t. 22 AMADOR Andrey MOVISTAR s.t. 23 LANDA MEANA Mikel SKY s.t. 25 PETILLI Simone UAE TEAM EMIRATES s.t. 26 VAN GARDEREN Tejay BMC s.t. 27 MEZGEC Luka ORICA-SCOTT s.t. 28 HERNANDEZ Jesus TREK-SEGAFREDO s.t. 29 KISERLOVSKI Robert KATUSHA-ALPECIN s.t. 30 TEUNS Dylan BMC s.t. 32 MONTAGUTI Matteo AG2R LA MONDIALE s.t. 33 BIDARD François AG2R LA MONDIALE s.t. 34 DE PLUS Laurens QUICK-STEP FLOORS s.t. 35 VERONA Carlos ORICA-SCOTT s.t. 36 HENAO GOMEZ Sebastian SKY s.t. 38 SENNI Manuel BMC s.t. 39 MORABITO Steve FDJ s.t. 40 ZEITS Andrey ASTANA s.t. 41 ROSA Diego SKY s.t. 42 WOODS Michael CANNONDALE-DRAPAC s.t. 43 SLAGTER Tom-Jelte CANNONDALE-DRAPAC s.t. 44 GESCHKE Simon TEAM SUNWEB s.t. 45 MARCZYNSKI Tomasz LOTTO SOUDAL s.t. 46 PLAZA Ruben ORICA-SCOTT s.t. 47 DE LA PARTE Victor MOVISTAR s.t. 48 PELLIZOTTI Franco BAHRAIN-MERIDA s.t. 49 ROLLAND Pierre CANNONDALE-DRAPAC s.t. 51 MAMYKIN Matvey KATUSHA-ALPECIN s.t. 54 SCHLEGEL Michal CCC SPRANDI POLKOWICE s.t. 55 LADAGNOUS Matthieu FDJ s.t. 56 TEN DAM Laurens TEAM SUNWEB s.t. 57 GONÇALVES Jose' KATUSHA-ALPECIN s.t. 58 TIRALONGO Paolo ASTANA s.t. 61 SANCHEZ Luis Leon ASTANA s.t. 62 ROJAS Jose MOVISTAR s.t. 63 IZAGUIRRE Gorka MOVISTAR s.t. 64 DOMBROWSKI Joseph Lloyd CANNONDALE-DRAPAC s.t. 65 SERRY Pieter QUICK-STEP FLOORS s.t. 66 BELKOV Maxim KATUSHA-ALPECIN s.t. 67 BOARO Manuele BAHRAIN-MERIDA s.t. 68 JUUL JENSEN Christopher ORICA-SCOTT s.t. 70 SIUTSOU Kanstantsin BAHRAIN-MERIDA s.t. 73 RODRIGUEZ MARTIN Cristian WILIER TRIESTINA-SELLE ITALIA s.t. 74 AMEZQUETA MORENO Julen WILIER TRIESTINA-SELLE ITALIA s.t. 75 ANACONA Winner MOVISTAR s.t. 76 VAN DEN BROECK Jurgen LOTTO NL-JUMBO s.t. 77 FOLIFOROV Alexander GAZPROM-RUSVELO s.t. 78 JANSE VAN RENSBURG Jacques DIMENSION DATA s.t. 79 GROSSCHARTNER Felix CCC SPRANDI POLKOWICE s.t. 80 SUTHERLAND Rory MOVISTAR s.t. 81 KOREN Kristijan CANNONDALE-DRAPAC s.t. 82 PIBERNIK Luka BAHRAIN-MERIDA s.t. 85 ZHUPA Eugert WILIER TRIESTINA-SELLE ITALIA s.t. 86 MARCATO Marco UAE TEAM EMIRATES s.t. 87 PATERSKI Maciej CCC SPRANDI POLKOWICE s.t. 88 AGNOLI Valerio BAHRAIN-MERIDA s.t. 89 BAK YTTING Lars LOTTO SOUDAL s.t. 90 TRATNIK Jan CCC SPRANDI POLKOWICE s.t. 91 BIZHIGITOV Zhandos ASTANA s.t. 92 ROSSKOPF Joseph BMC s.t. 93 BUSATO Matteo WILIER TRIESTINA-SELLE ITALIA s.t. 94 HOFLAND Moreno LOTTO SOUDAL s.t. 95 BENEDETTI Cesare BORA-HANSGROHE s.t. 96 GASPAROTTO Enrico BAHRAIN-MERIDA s.t. 97 BERARD Julien AG2R LA MONDIALE s.t. 98 BARBIN Enrico BARDIANI CSF s.t. 99 MAESTRI Mirco BARDIANI CSF s.t. 100 SHALUNOV Evgeny GAZPROM-RUSVELO s.t. 101 CHEVRIER Clement AG2R LA MONDIALE s.t. 102 PREIDLER Georg TEAM SUNWEB s.t. 103 MUHLBERGER Gregor BORA-HANSGROHE s.t. 104 FARIA DA COSTA Rui Alberto UAE TEAM EMIRATES s.t. 105 TCATEVICH Aleksei GAZPROM-RUSVELO s.t. 106 MOHORIC Matej UAE TEAM EMIRATES s.t. 107 CONTI Valerio UAE TEAM EMIRATES s.t. 108 LUNKE Sindre Skjøstad TEAM SUNWEB s.t. 109 LUDVIGSSON Tobias FDJ s.t. 111 JAUREGUI Quentin AG2R LA MONDIALE s.t. 112 KOSHEVOY Ilia WILIER TRIESTINA-SELLE ITALIA s.t. 113 STAMSNIJDER Tom TEAM SUNWEB s.t. 114 DILLIER Silvan BMC s.t. 115 TEKLEHAIMANOT Daniel DIMENSION DATA s.t. 116 CAPECCHI Eros QUICK-STEP FLOORS s.t. 117 VENTOSO Francisco BMC s.t. 118 ROVNY Ivan GAZPROM-RUSVELO s.t. 119 SAMOILAU Branislau CCC SPRANDI POLKOWICE s.t. 120 LOSADA Alberto KATUSHA-ALPECIN s.t. 121 BILBAO LOPEZ Pello ASTANA s.t. 122 BERHANE Natnael DIMENSION DATA s.t. 123 STETINA Peter TREK-SEGAFREDO s.t. 124 GOLAS Michal SKY s.t. 125 ALAFACI Eugenio TREK-SEGAFREDO s.t. 126 BIALOBLOCKI Marcin CCC SPRANDI POLKOWICE s.t. 127 VAN EMDEN Jos LOTTO NL-JUMBO s.t. 128 QUINZIATO Manuel BMC s.t. 129 MOLARD Rudy FDJ s.t. 130 CASTELIJNS Twan LOTTO NL-JUMBO s.t. 131 HAGA Chad TEAM SUNWEB s.t. 132 KEIZER Martijn LOTTO NL-JUMBO s.t. 133 PUCCIO Salvatore SKY s.t. 134 FIRSANOV Sergey GAZPROM-RUSVELO s.t. 135 VAUGRENARD Benoit FDJ s.t. 136 ROTA Lorenzo BARDIANI CSF s.t. 137 SBARAGLI Kristian DIMENSION DATA s.t. 138 GAVIRIA Fernando QUICK-STEP FLOORS s.t. 139 HERRADA Jose MOVISTAR s.t. 140 VICIOSO Angel KATUSHA-ALPECIN s.t. 141 MARTINELLI Davide QUICK-STEP FLOORS s.t. 142 BRUTT Pavel GAZPROM-RUSVELO s.t. 143 BARTA Jan BORA-HANSGROHE s.t. 144 BENNETT Sam BORA-HANSGROHE s.t. 145 VAN ZYL Johann DIMENSION DATA s.t. 146 POSTLBERGER Lukas BORA-HANSGROHE s.t. 147 KEISSE Iljo QUICK-STEP FLOORS s.t. 148 RICHEZE Maximiliano QUICK-STEP FLOORS s.t. 149 KUZNETSOV Viacheslav KATUSHA-ALPECIN s.t. 150 FONZI Giuseppe WILIER TRIESTINA-SELLE ITALIA s.t. 151 BOEM Nicola BARDIANI CSF s.t. 152 KIRYIENKA Vasil SKY s.t. 153 KOZONTCHUK Dmitriy GAZPROM-RUSVELO s.t. 154 HOWES Alex CANNONDALE-DRAPAC s.t. 155 ANDREETTA Simone BARDIANI CSF s.t. 156 PEDERSEN Mads TREK-SEGAFREDO s.t. 157 STUYVEN Jasper TREK-SEGAFREDO s.t. 158 FERRARI Roberto UAE TEAM EMIRATES s.t. 159 TUFT Svein ORICA-SCOTT s.t. 160 HEPBURN Michael ORICA-SCOTT s.t. 161 CARTHY Hugh CANNONDALE-DRAPAC s.t. 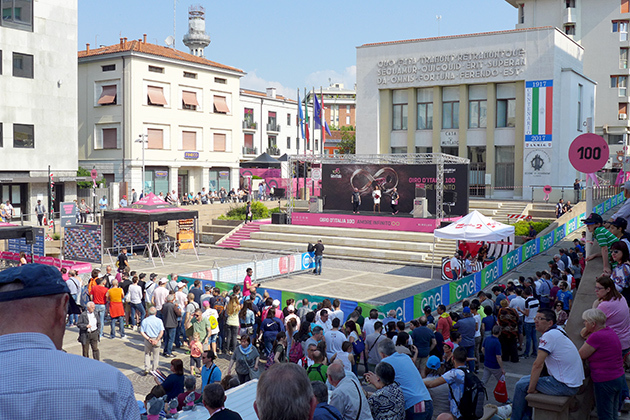 At the stage start city of Pordenone. The stage will start here in two and half hours, but the tifosi are already here. It's already noisy and exciting as the fans wait for their cycling gods. Race leader Nairo Quintana has signed in. 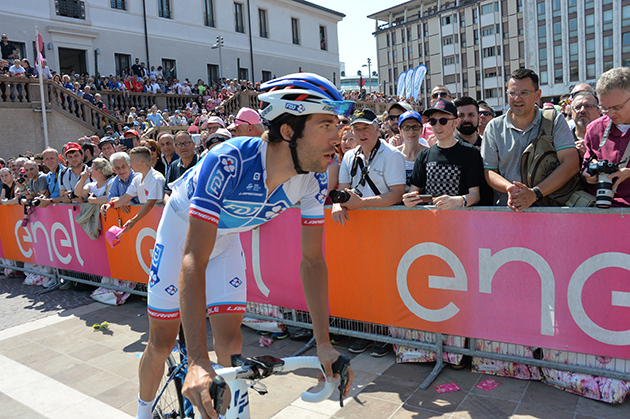 Thibaut Pinot heads to the start line. Nairo Quintana leads the break to the finish line. The group with Dumoulin, Yates, Mollema and Jungels is 15 seconds behind. Thibaut Pinot leads the front group to the line. And gets the stage win. Jan Hirt finished 11th, 20 seconds after Pinot. 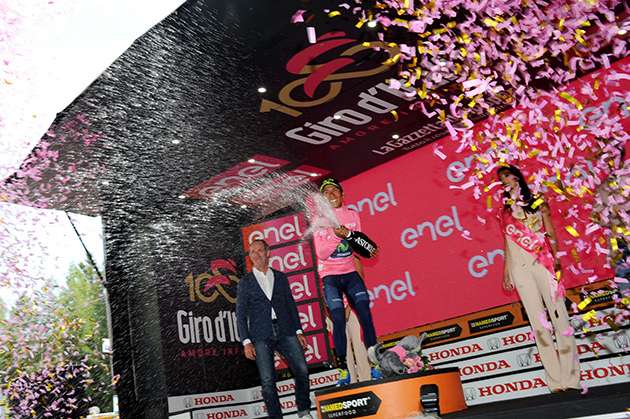 Nairo Quintana celebrates his GC leadership. 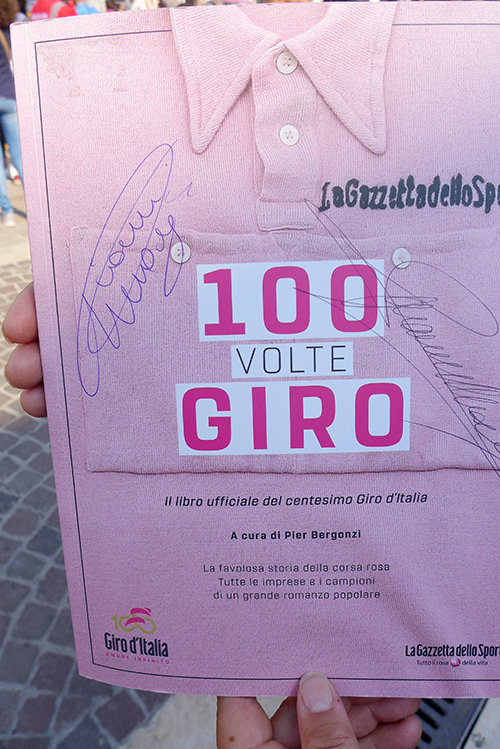 But he will have to ride an extraordinary time trial Sunday if he is to wear pink at the end of the day. 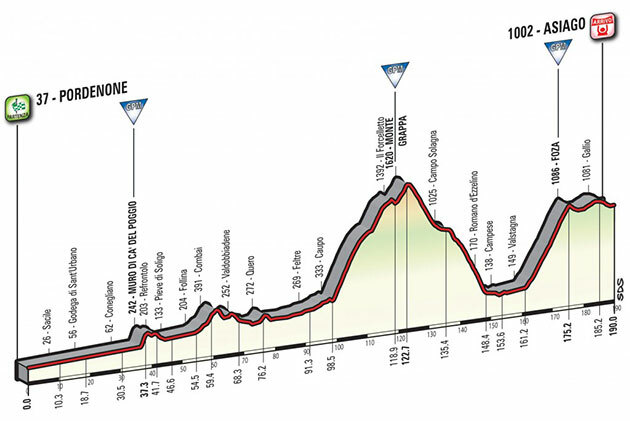 Organizer's preview: A very long stage with long climbs. 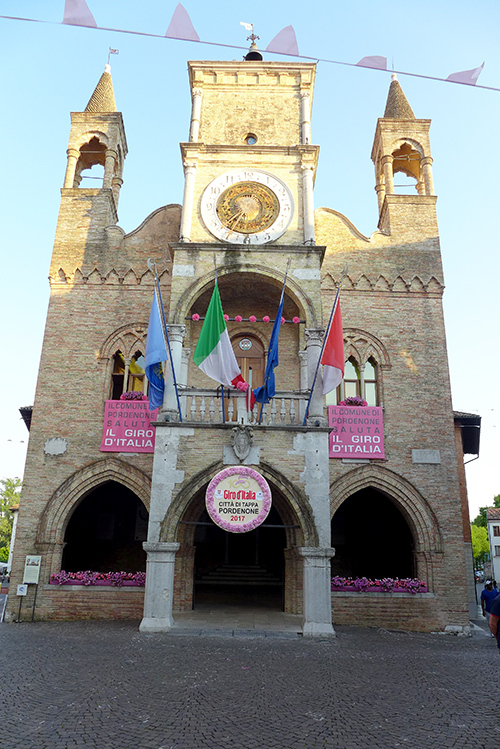 After the first half across the hilly region around Treviso famous for its Prosecco vineyards, the route reaches Feltre where (in Caupo) it climbs up Monte Grappa on its north side. It is a climb measuring 24 km in length with long sections at 7-8% gradients alternating with short apparently flat ground stretches or descents. A very long descent heading to Romano d’Ezzelino is followed by 10 km on a flat section leading to the 14 km climb up to Foza at a gradient of 7.1%. The stage route runs over the final wavy 10 km to the finish in Asiago. 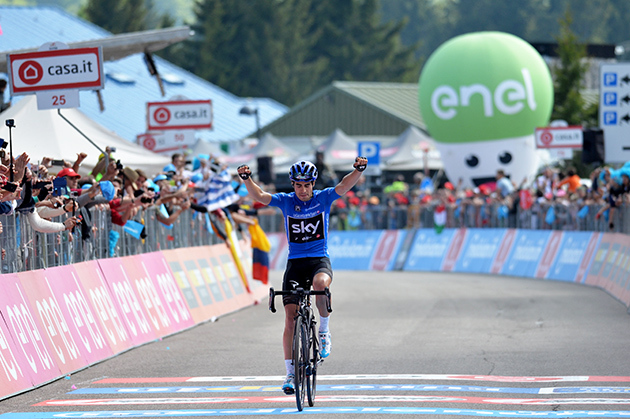 Weather at the finish town of Piancavallo at 2:00 PM local time: 14C (58F), partly cloudy, with the wind from the SSE at 13 km/hr (8 mph). No rain is forecast. 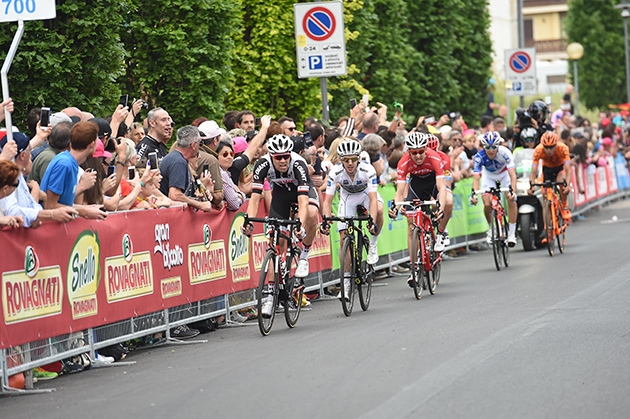 The race: All 165 of yesterday's stage 18 finishers began today's stage at 12:06 PM, local time. And then just 6 kilometers into the stage, Bram Tankink retired. Though this is not the final day in the mountains, this is the final stage with a hilltop finish. Here's the stage as it happened: With about 100 kilometers to go, there is a lead group of non-GC contenders. But following is a potent small group with Quintana, Nibali, Pinot, Zakarin, Pozzovivo and Mollema riding about 40 seconds ahead of a desperately chasing group containing race leader Tom Dumoulin. Team Sunweb says that Dumoulin was having a "natural break" when he was attacked. 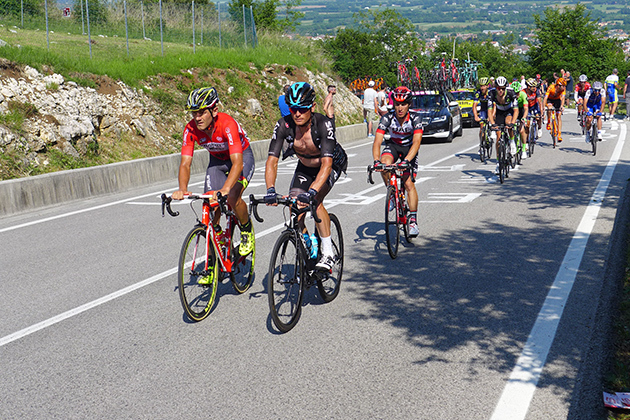 On the second-category Sella Chianzutan, first the Qunitana-Nibali group caught the front break and then the Dumoulin chasers joined the leaders. 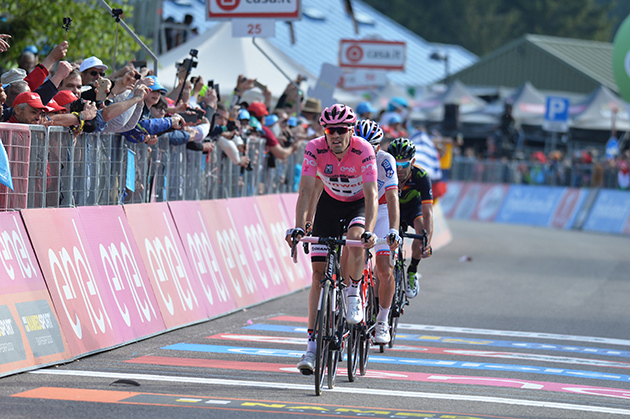 For now, Dumoulin's crisis is over. Eurosport initially said Movistar rider Jose Joaquin Rojas was with Dumoulin when Dumoulin had to make a toilet stop. Rojas radioed his team that the maglia rosa was stopped, thus triggering the attack. Eurosport later said that report turned out to be incorrect and Dumoulin had simply been caught behind the peloton. With 70 kilometers to go, a new break of non-contenders formed and is a minute up the road. 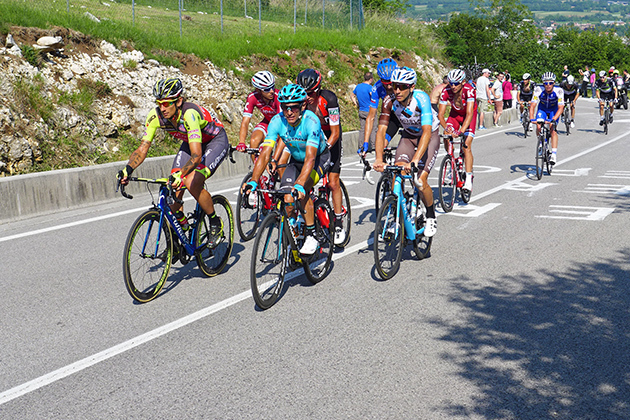 On the final climb to Piancavallo there is a high-quality break with Mikel Landa and Pierre Rolland. The group with GC contenders are almost 10 minutes back. 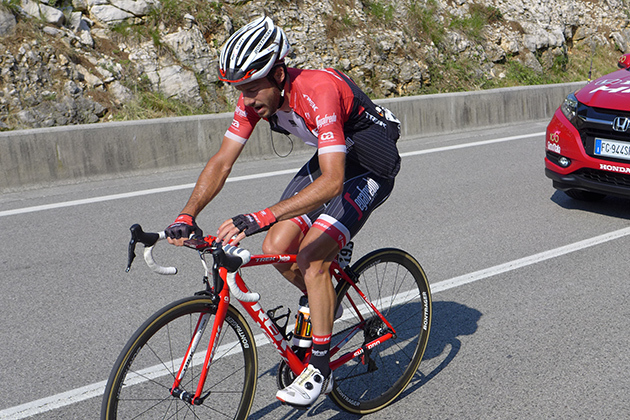 Dumoulin is struggling on the steep parts, but is maintaining a precarious contact. With 8 km to go, Dumoulin again lost contact and a steep 14% section is yet to come. A kilometer later Dumoulin is 20 seconds behind the other contenders. With 4 km to go, the steepest part of the ascent is behind him. But Dumoulin will have to dig deep to make up that time, now about 30 seconds. Up front Mikel Landa has a minute lead on Pierre Rolland and Rui Faria da Costa. 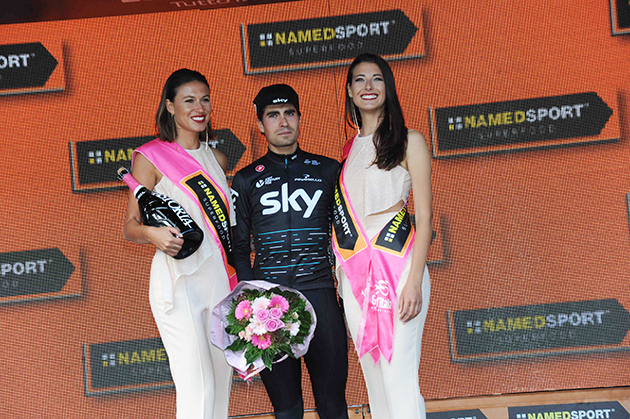 Mikel Landa did hold his lead to the end, giving him a prestigious stage win. 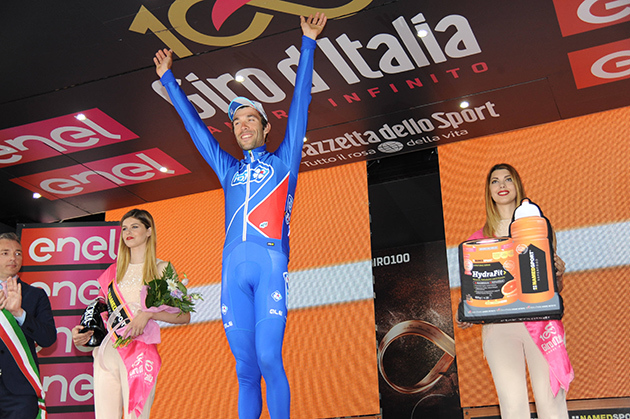 Thibaut Pinot was first of the contenders, followed by Nairo Quintana and Vincenzo Nibali. Tom Dumoulin lost about a minute to Quintana, making Quintana the new GC leader. 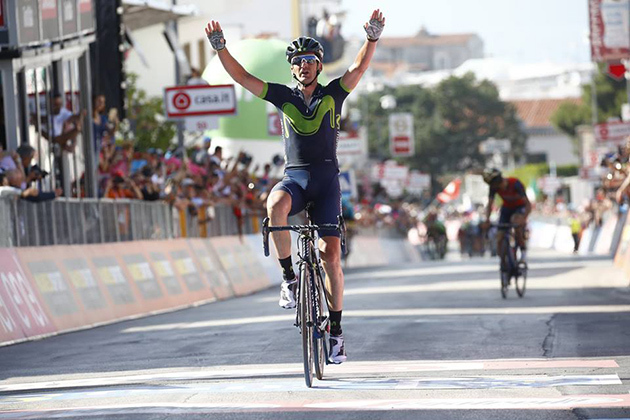 It was many stages in one, and another true show of dedication and consistency by the Movistar Team. 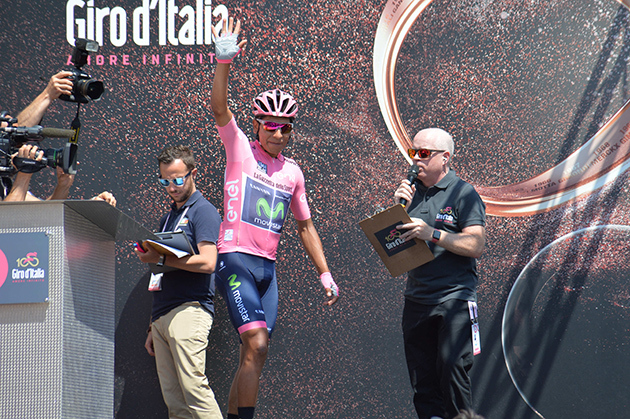 Nairo Quintana got back to the first place of the Giro d'Italia after extraordinary work from the telephone squad, and now wears pink just 48 hours before the race ends in Milan. 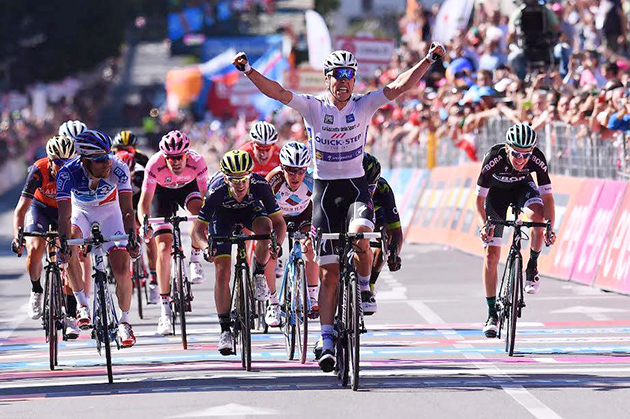 Stage 19 - 191km from San Candido to the Cat-1 Piancavallo climb, including three other ascents and its fast, tricky descents in the beginning of the race - made race leader Tom Dumoulin (SUN) crack and saw all big GC contenders suffer. From that suffering emerged the 'Cóndor' to get the Maglia Rosa back, almost two weeks after his solid display on the Blockhaus. 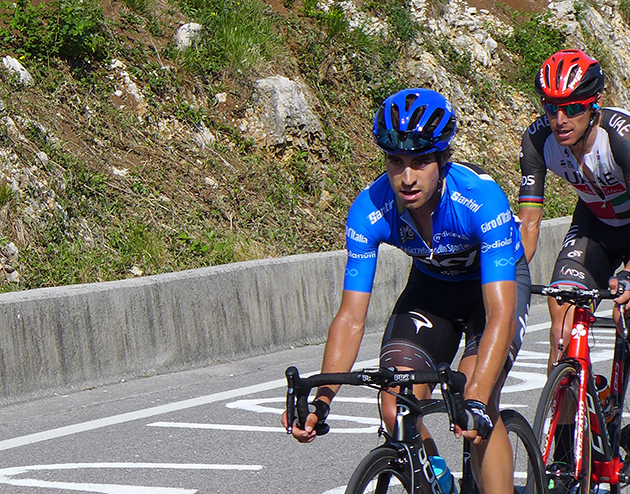 The Movistar Team pushed hard with several of their members at the descent of the non-rated Cima Sappada, 65km into the stage, taking advantage from bad positioning from Dumoulin inside the bunch at the downhill. A furious fight between all GC teams in the forthcoming 40 kilometers ended up well after the foot of the Cat-2 Sella Chianzutan climb, where a 20-rider group, including Dumoulin and rivals Nairo, Nibali (TBM), Pinot (FDJ), slowed their pace again and left room for most of the original, early escapees to continue with their action. 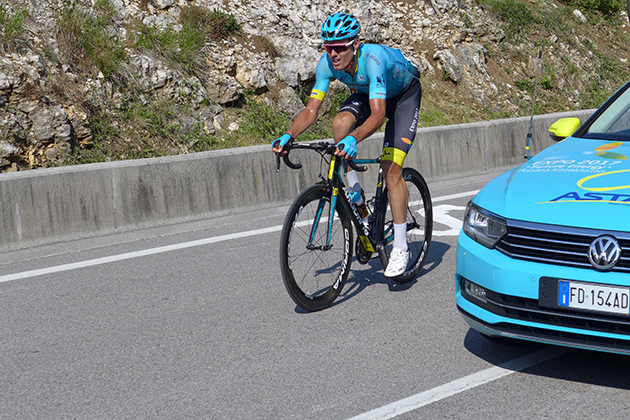 José Joaquín Rojas and José Herrada joined a breakaway which included eventual stage winner Mikel Landa (SKY), the Movistar Team duo dropping back at the climb to support Nairo. 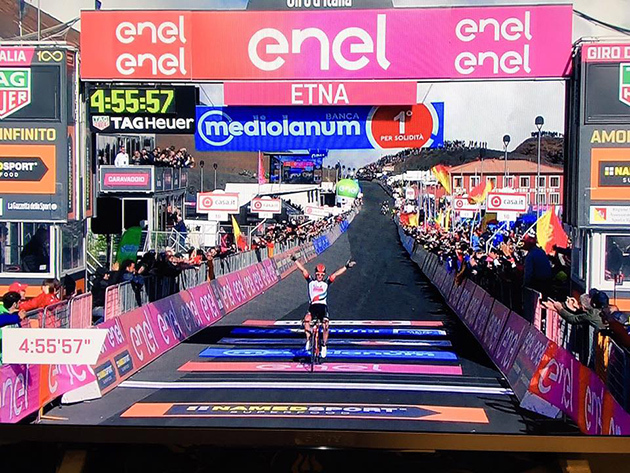 Víctor de la Parte and Winner Anacona pushed hard from the bottom of the Piancavallo and made Dumoulin crack, the Dutchman losing meter by meter to end up with more than a minute at the top. 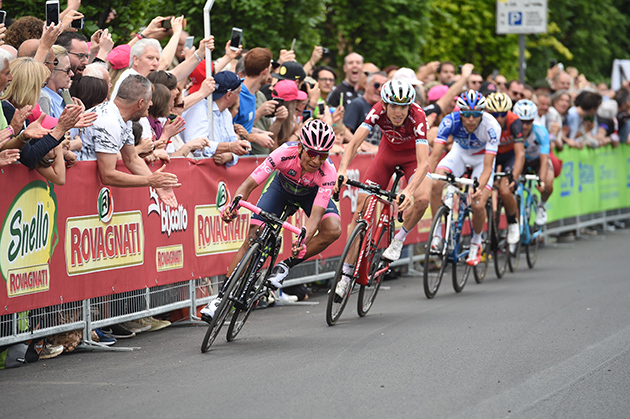 Ahead, Quintana resisted thanks to Herrada and Rojas, and only conceded 12" to Pinot, first GC contender over the line, and 6" to Pozzovivo (ALM) and Zakarin (KAT), who jumped away from the field a couple of kilometers after the Frenchman. 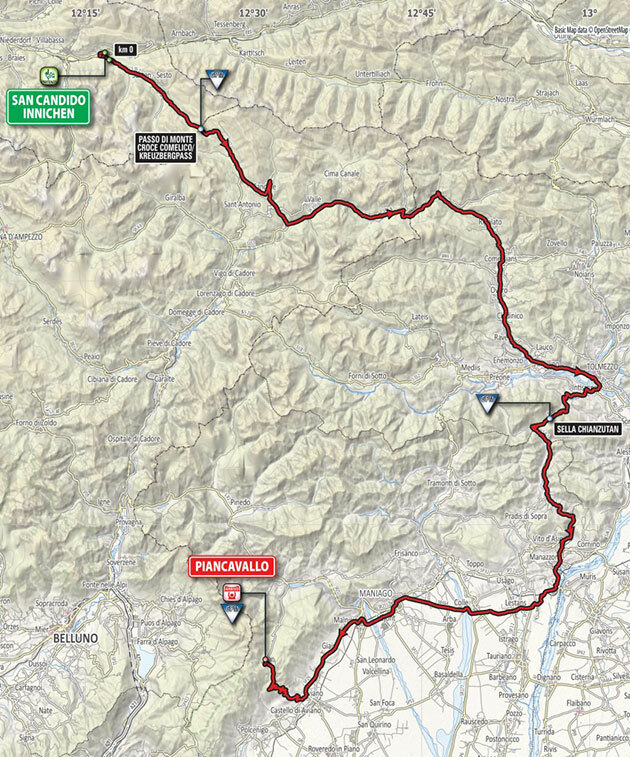 The overall classification remains a tight game as Quintana, Dumoulin (+38"), Nibali (+43"), Pinot (+53"), Zakarin (+1'21") and Pozzovivo are within a minute and a half's distance before the Milano TT (Sunday) and the last mountain stage on Saturday: 190km between Pordenone and Asiago, which will feature the infamous Monte Grappa (Cat-1), 68km from the end, and the Foza (Cat-1) ascent, crested just 15km from the finish. 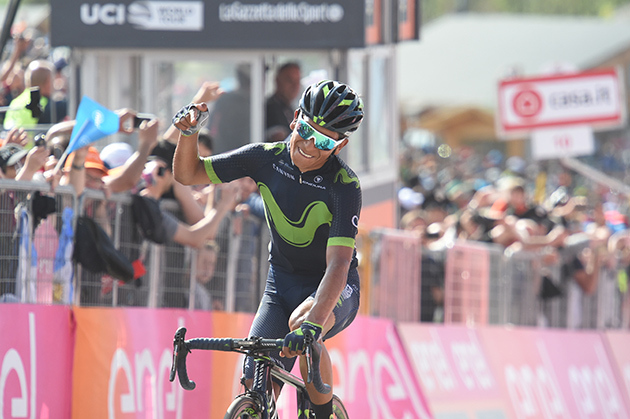 Nairo Quintana: “It was a very, very hard day, where all the efforts from Thursday and the stages before ended up paying off. 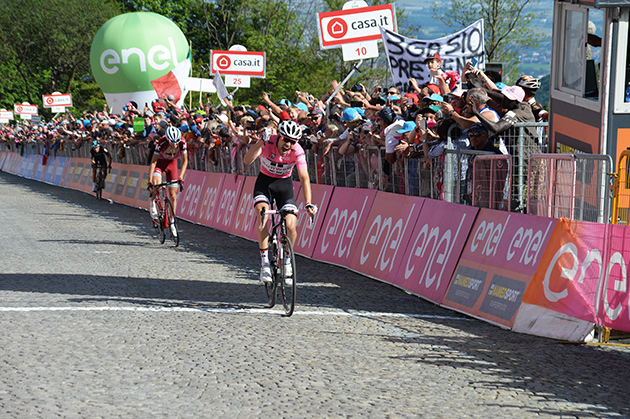 We've spent the whole Giro working our hearts out to take the overall win, and we had to keep trying again today. "We took a long shot at that descent with most of the team, and also pushed hard into the final climb, initially with a strong relay from Winner Anacona and then with Rojas and José Herrada, who gave all they had at their own moments. The impressive job by the whole team was evident again this time, and I can't thank them enough and recoginise all that they do for me, not only riders but the whole staff, sports directors... We planned a good strategy, we delivered and we were able to make the race leader crack and remain close to the rest of GC contenders. "You've always got doubts about what wheel should you follow on that final climb. I knew I had to keep an eye especially on Nibali, but sometimes, it's up to other rivals to leave you behind and create gaps which are really difficult to close. However, you also need to measure your efforts well. Sometimes, a pedal stroke too much means precious seconds that you lose at the end. "We just hope to keep this strong line tomorrow and defend ourselves well. The TT on Sunday - well, that's a final battle, one-to-one, where we must leave everything that we've got. There's a lot of pressure on our shoulders, our rivals are also really strong, but we've got the Maglia Rosa at the moment and we will try to defend it with honour. We've got a veteran group, we're consistent, experienced, and I trust my whole group of team-mates to defend ourselves well tomorrow." 7 SANCHEZ Luis Leon ASTANA s.t. 9 ROTA Lorenzo BARDIANI CSF s.t. 13 ZAKARIN Ilnur KATUSHA-ALPECIN s.t. 15 YATES Adam ORICA-SCOTT s.t. 16 QUINTANA Nairo MOVISTAR s.t. 18 NIBALI Vincenzo BAHRAIN-MERIDA s.t. 19 HIRT Jan CCC SPRANDI POLKOWICE s.t. 23 REICHENBACH Sébastien FDJ s.t. 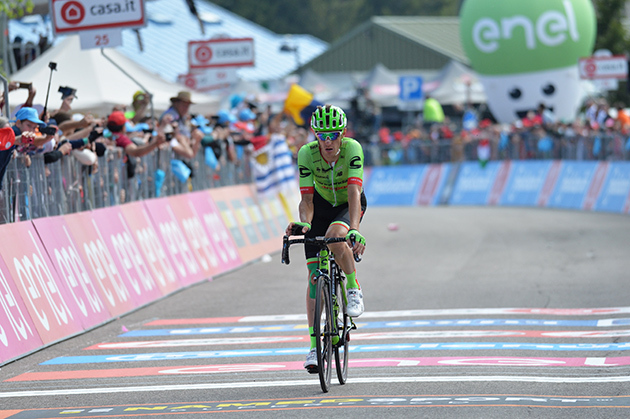 24 FORMOLO Davide CANNONDALE-DRAPAC s.t. 25 ROJAS Jose MOVISTAR s.t. 29 POLANC Jan UAE TEAM EMIRATES s.t. 30 KRUIJSWIJK Steven LOTTO NL-JUMBO s.t. 33 DUPONT Hubert AG2R LA MONDIALE s.t. 35 HERNANDEZ Jesus TREK-SEGAFREDO s.t. 36 MUHLBERGER Gregor BORA-HANSGROHE s.t. 41 BERNARD Julien TREK-SEGAFREDO s.t. 42 CATALDO Dario ASTANA s.t. 43 JAUREGUI Quentin AG2R LA MONDIALE s.t. 44 ZEITS Andrey ASTANA s.t. 46 FOLIFOROV Alexander GAZPROM-RUSVELO s.t. 49 GESCHKE Simon TEAM SUNWEB s.t. 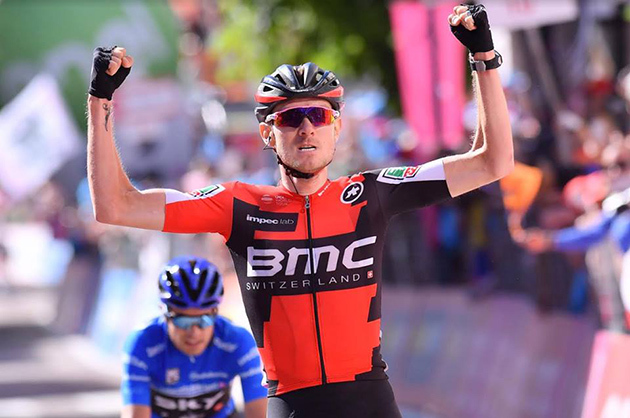 50 VAN GARDEREN Tejay BMC s.t. 51 HANSEN Jesper ASTANA s.t. 52 CICCONE Giulio BARDIANI CSF s.t. 53 TCATEVICH Aleksei GAZPROM-RUSVELO s.t. 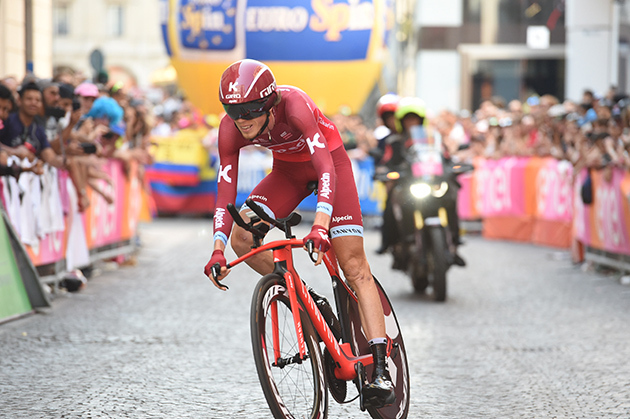 56 KISERLOVSKI Robert KATUSHA-ALPECIN s.t. 57 MAMYKIN Matvey KATUSHA-ALPECIN s.t. 59 SIUTSOU Kanstantsin BAHRAIN-MERIDA s.t. 60 VAN DEN BROECK Jurgen LOTTO NL-JUMBO s.t. 62 POZZATO Filippo WILIER TRIESTINA-SELLE ITALIA s.t. 63 SENNI Manuel BMC s.t. 64 FIRSANOV Sergey GAZPROM-RUSVELO s.t. 66 FRAILE Omar DIMENSION DATA s.t. 67 RODRIGUEZ MARTIN Cristian WILIER TRIESTINA-SELLE ITALIA s.t. 68 BIZHIGITOV Zhandos ASTANA s.t. 69 MORABITO Steve FDJ s.t. 70 ROY Jérémy FDJ s.t. 71 DE LA PARTE Victor MOVISTAR s.t. 72 ANTON Igor DIMENSION DATA s.t. 73 TIRALONGO Paolo ASTANA s.t. 74 SBARAGLI Kristian DIMENSION DATA s.t. 75 MARCATO Marco UAE TEAM EMIRATES s.t. 76 TRATNIK Jan CCC SPRANDI POLKOWICE s.t. 77 STETINA Peter TREK-SEGAFREDO s.t. 78 HANSEN Adam LOTTO SOUDAL s.t. 79 CLEMENT Stef LOTTO NL-JUMBO s.t. 80 BATTAGLIN Enrico LOTTO NL-JUMBO s.t. 81 KOZONTCHUK Dmitriy GAZPROM-RUSVELO s.t. 84 BELKOV Maxim KATUSHA-ALPECIN s.t. 86 ANDREETTA Simone BARDIANI CSF s.t. 89 MARCZYNSKI Tomasz LOTTO SOUDAL s.t. 90 LUDVIGSSON Tobias FDJ s.t. 91 LADAGNOUS Matthieu FDJ s.t. 92 ZHUPA Eugert WILIER TRIESTINA-SELLE ITALIA s.t. 93 MENDES Jose' BORA-HANSGROHE s.t. 94 BENEDETTI Cesare BORA-HANSGROHE s.t. 95 OWSIAN Lukasz CCC SPRANDI POLKOWICE s.t. 96 ROSA Diego SKY s.t. 97 HOFLAND Moreno LOTTO SOUDAL s.t. 98 SLAGTER Tom-Jelte CANNONDALE-DRAPAC s.t. 99 PUCCIO Salvatore SKY s.t. 100 TEUNS Dylan BMC s.t. 101 FONZI Giuseppe WILIER TRIESTINA-SELLE ITALIA s.t. 102 VILLELLA Davide CANNONDALE-DRAPAC s.t. 103 LUNKE Sindre Skjøstad TEAM SUNWEB s.t. 104 VAN EMDEN Jos LOTTO NL-JUMBO s.t. 105 TEKLEHAIMANOT Daniel DIMENSION DATA s.t. 106 KEIZER Martijn LOTTO NL-JUMBO s.t. 107 BARBIN Enrico BARDIANI CSF s.t. 108 MAESTRI Mirco BARDIANI CSF s.t. 109 GROSSCHARTNER Felix CCC SPRANDI POLKOWICE s.t. 110 SCHLEGEL Michal CCC SPRANDI POLKOWICE s.t. 111 MOHORIC Matej UAE TEAM EMIRATES s.t. 112 CONTI Valerio UAE TEAM EMIRATES s.t. 113 DEIGNAN Philip SKY s.t. 114 AGNOLI Valerio BAHRAIN-MERIDA s.t. 115 PETILLI Simone UAE TEAM EMIRATES s.t. 116 HEPBURN Michael ORICA-SCOTT s.t. 117 SUTHERLAND Rory MOVISTAR s.t. 118 BERARD Julien AG2R LA MONDIALE s.t. 119 HAGA Chad TEAM SUNWEB s.t. 120 RAVASI Edward UAE TEAM EMIRATES s.t. 121 KOREN Kristijan CANNONDALE-DRAPAC s.t. 122 ROSSKOPF Joseph BMC s.t. 123 WOODS Michael CANNONDALE-DRAPAC s.t. 124 BERHANE Natnael DIMENSION DATA s.t. 125 MEZGEC Luka ORICA-SCOTT s.t. 126 GOLAS Michal SKY s.t. 127 SAMOILAU Branislau CCC SPRANDI POLKOWICE s.t. 128 PATERSKI Maciej CCC SPRANDI POLKOWICE s.t. 129 LOSADA Alberto KATUSHA-ALPECIN s.t. 131 DOMBROWSKI Joseph Lloyd CANNONDALE-DRAPAC s.t. 132 BARTA Jan BORA-HANSGROHE s.t. 133 VAN ZYL Johann DIMENSION DATA s.t. 134 BAK YTTING Lars LOTTO SOUDAL s.t. 135 BRUTT Pavel GAZPROM-RUSVELO s.t. 136 TEN DAM Laurens TEAM SUNWEB s.t. 137 KIRYIENKA Vasil SKY s.t. 138 DEVENYNS Dries QUICK-STEP FLOORS s.t. 139 QUINZIATO Manuel BMC s.t. 140 RICHEZE Maximiliano QUICK-STEP FLOORS s.t. 141 KEISSE Iljo QUICK-STEP FLOORS s.t. 142 GAVIRIA Fernando QUICK-STEP FLOORS s.t. 143 DILLIER Silvan BMC s.t. 144 LAGUTIN Sergey GAZPROM-RUSVELO s.t. 145 POSTLBERGER Lukas BORA-HANSGROHE s.t. 146 CARTHY Hugh CANNONDALE-DRAPAC s.t. 147 BIALOBLOCKI Marcin CCC SPRANDI POLKOWICE s.t. 148 VAUGRENARD Benoit FDJ s.t. 149 IZAGUIRRE Gorka MOVISTAR s.t. 150 VENTOSO Francisco BMC s.t. 151 AMADOR Andrey MOVISTAR s.t. 152 GONÇALVES Jose' KATUSHA-ALPECIN s.t. 153 HOWES Alex CANNONDALE-DRAPAC s.t. 154 AMEZQUETA MORENO Julen WILIER TRIESTINA-SELLE ITALIA s.t. 155 VICIOSO Angel KATUSHA-ALPECIN s.t. 156 JUUL JENSEN Christopher ORICA-SCOTT s.t. 157 TUFT Svein ORICA-SCOTT s.t. 159 STUYVEN Jasper TREK-SEGAFREDO s.t. 160 MARTINELLI Davide QUICK-STEP FLOORS s.t. 161 ALAFACI Eugenio TREK-SEGAFREDO s.t. 162 BENNETT Sam BORA-HANSGROHE s.t. 163 FERRARI Roberto UAE TEAM EMIRATES s.t. 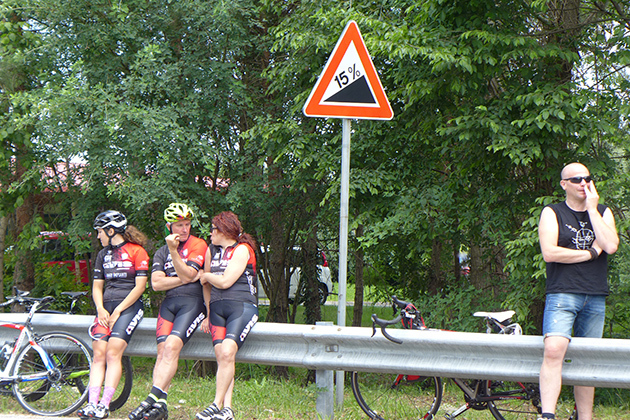 About 1.5 kilometers into the ascent to Piancavallo. The Tifosi wait for the riders. This is probably Luis Leon Sanchez hammering up the mountain. Mikel Landa and Rui Costa, first and second in the stage. You can see Quintana look back at Nibali after Tom Dumoulin has been dropped. 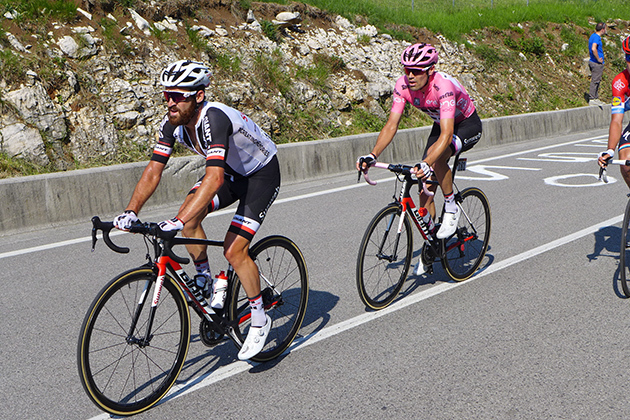 Simon Geschke leads his team captain and race leader, Tom Dumoulin. Steve Morabito and Jérémy Roy seemed transfixed by their power meters as they suffer their way up the mountain. Filippo "Tattoo Man" Pozzato leads a group. Points leader Fernando Gaviria has found a bit of shade. This is certainly not his kind of turf. Michal Schlegal has a Coke and a smile (?). Sky rider Vasil Kiryienka is taking the climb easily enough to ride with his mouth closed. 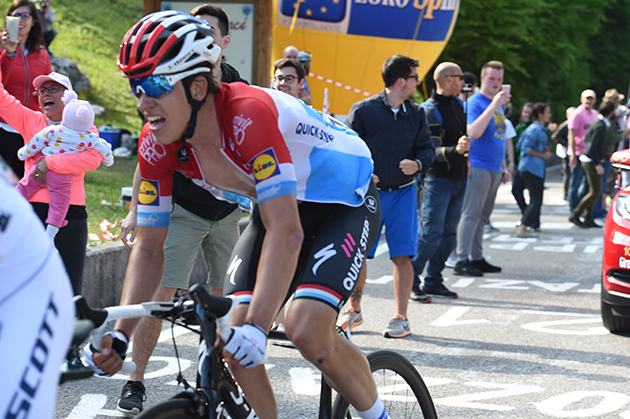 Bob Jungels on the Piancavallo ascent. He is no longer the best young rider, so he's reduced to wearing his national champion's jersey. Thibaut Pinot finished 11th today. Mikel Landa takes the win. Rui Faria da Costa was second. Pierre Rolland was third today. Nairo Quintana is the GC leader with two days to go. 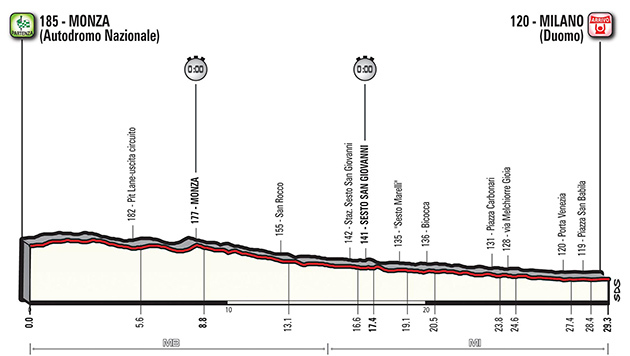 Organizer's preview: The stage course features two climbs right after the start (Monte Croce Comelico and Sappada) followed by a long descent with the short but quite steep climb of Sella Chianzutan before the second half of the parcours heading to Aviano. 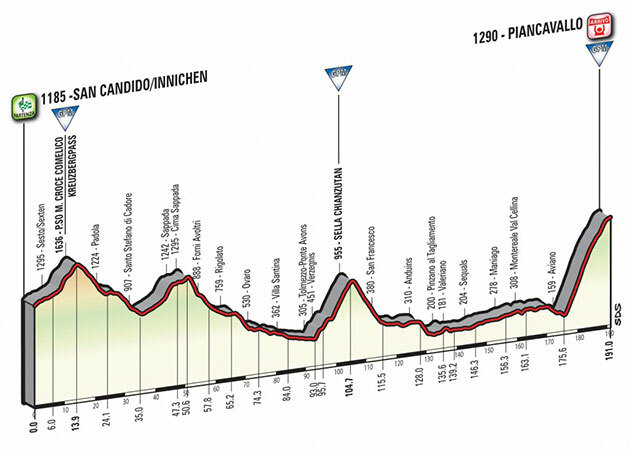 The parcours then runs on a final steep 14-km ascent, where the first 6 km are at a gradient around 10% (topping15%) and then the climb becomes milder though very hard still until the finish (Pantani’s feat in 1998). 2 LANDA MEANA Mikel SKY s.t. 8 MOLLEMA Bauke TREK-SEGAFREDO s.t. 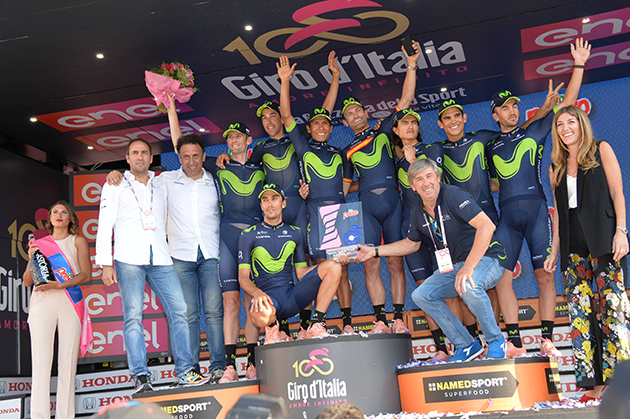 10 QUINTANA Nairo MOVISTAR s.t. 8 JUNGELS Bob QUICK-STEP FLOORS s.t. 9 YATES Adam ORICA-SCOTT s.t. 10 PINOT Thibaut FDJ s.t. 2 QUINTANA Nairo MOVISTAR s.t. 3 PINOT Thibaut FDJ s.t. 4 YATES Adam ORICA-SCOTT s.t. 5 POZZOVIVO Domenico AG2R LA MONDIALE s.t. 6 KONRAD Patrick BORA-HANSGROHE s.t. 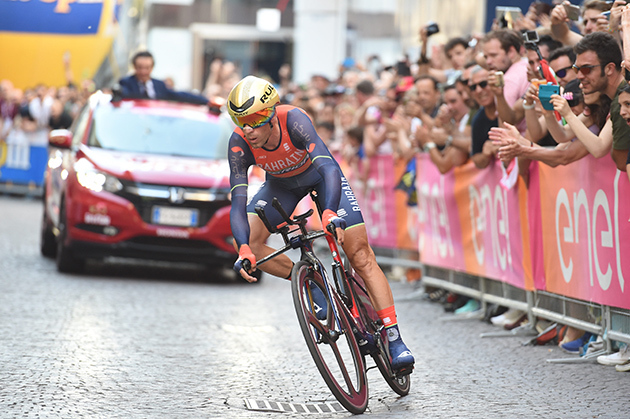 7 NIBALI Vincenzo BAHRAIN-MERIDA s.t. 8 DUMOULIN Tom TEAM SUNWEB s.t. 9 ZAKARIN Ilnur KATUSHA-ALPECIN s.t. 10 MOLLEMA Bauke TREK-SEGAFREDO s.t. 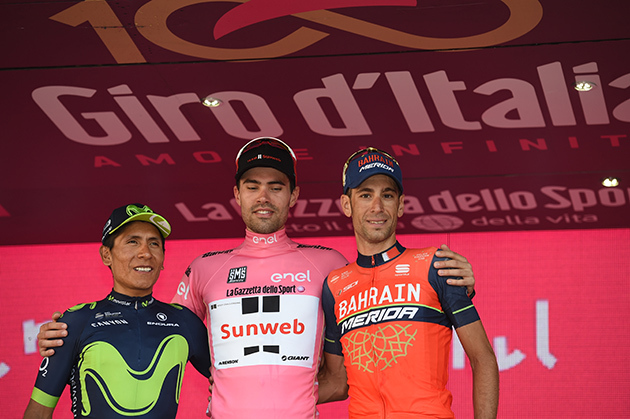 Tom Dumoulin wins the stage wearing pink. 8 PELLIZOTTI Franco BAHRAIN-MERIDA s.t. 10 KANGERT Tanel ASTANA s.t. 3 STUYVEN Jasper TREK-SEGAFREDO s.t. 4 FERRARI Roberto UAE TEAM EMIRATES s.t. 5 GIBBONS Ryan DIMENSION DATA s.t. 6 SELIG Rudiger BORA-HANSGROHE s.t. 7 MODOLO Sacha UAE TEAM EMIRATES s.t. 8 EWAN Caleb ORICA-SCOTT s.t. 9 GREIPEL Andre' LOTTO SOUDAL s.t. 10 KUZNETSOV Viacheslav KATUSHA-ALPECIN s.t. 9 KANGERT Tanel ASTANA s.t. 2 MARECZKO Jakub WILIER TRIESTINA-SELLE ITALIA s.t. 3 BENNETT Sam BORA-HANSGROHE s.t. 4 BAUHAUS Phil TEAM SUNWEB s.t. 5 RICHEZE Maximiliano QUICK-STEP FLOORS s.t. 6 GIBBONS Ryan DIMENSION DATA s.t. 8 GREIPEL Andre' LOTTO SOUDAL s.t. 9 STUYVEN Jasper TREK-SEGAFREDO s.t. 10 FERRARI Roberto UAE TEAM EMIRATES s.t. 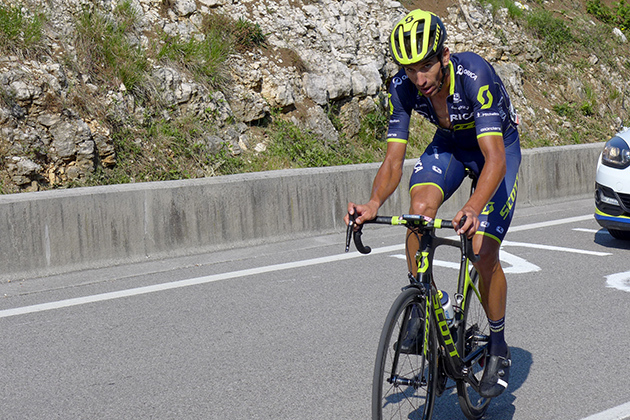 Omar Fraile wins Giro stage 11. 2 FARIA DA COSTA Rui Alberto UAE TEAM EMIRATES s.t. 3 ROLLAND Pierre CANNONDALE-DRAPAC s.t. 4 KANGERT Tanel ASTANA s.t. 5 VISCONTI Giovanni BAHRAIN-MERIDA s.t. 6 HERMANS Ben BMC s.t. 7 CATALDO Dario ASTANA s.t. 8 PETILLI Simone UAE TEAM EMIRATES s.t. 10 DE PLUS Laurens QUICK-STEP FLOORS s.t. 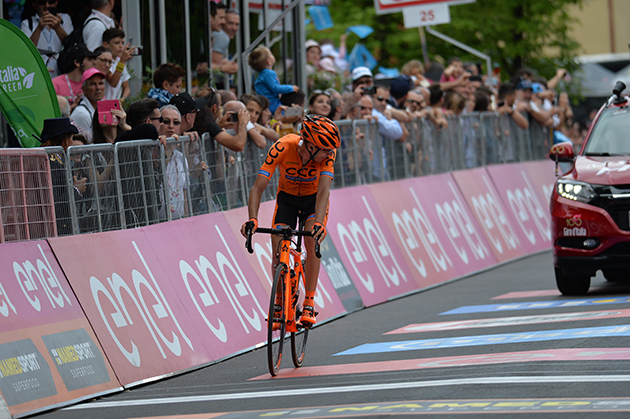 Tom Dumoulin turns in a superb ride, winning both the stage and the GC lead. Sirotti photo. 3 DUMOULIN Tom TEAM SUNWEB s.t. 5 WOODS Michael CANNONDALE-DRAPAC s.t. 6 PINOT Thibaut FDJ s.t. 8 YATES Adam ORICA-SCOTT s.t. 9 KRUIJSWIJK Steven LOTTO NL-JUMBO s.t. 10 JUNGELS Bob QUICK-STEP FLOORS s.t. 4 NIBALI Vincenzo BAHRAIN-MERIDA s.t. 6 DUMOULIN Tom TEAM SUNWEB s.t. 7 QUINTANA Nairo MOVISTAR s.t. 9 PINOT Thibaut FDJ s.t. 10 AMADOR Andrey MOVISTAR s.t. Caleb Ewan (center) gets this stage. 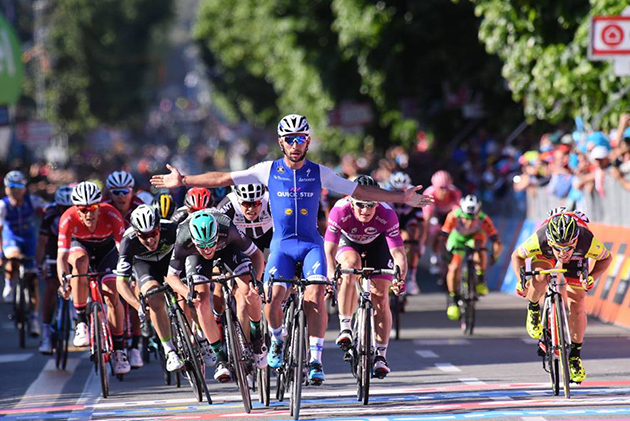 2 GAVIRIA Fernando QUICK-STEP FLOORS s.t. 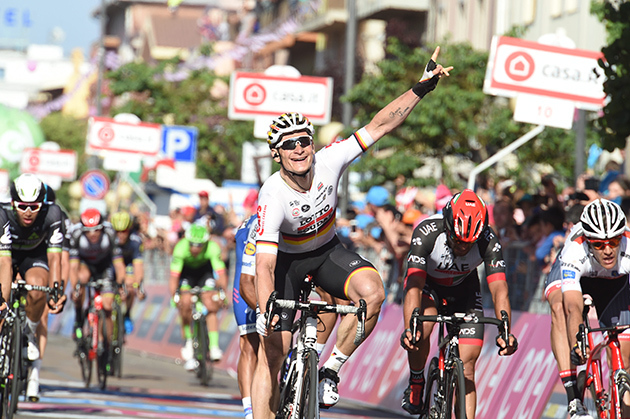 4 GREIPEL Andre' LOTTO SOUDAL s.t. 5 STUYVEN Jasper TREK-SEGAFREDO s.t. 8 SELIG Rudiger BORA-HANSGROHE s.t. 9 TCATEVICH Aleksei GAZPROM-RUSVELO s.t. 10 NIBALI Vincenzo BAHRAIN-MERIDA s.t. 10 VAN GARDEREN Tejay BMC s.t. 2 STUYVEN Jasper TREK-SEGAFREDO s.t. 6 YATES Adam ORICA-SCOTT s.t. 7 KELDERMAN Wilco TEAM SUNWEB s.t. 10 THOMAS Geraint SKY s.t. 6 QUINTANA Nairo MOVISTAR s.t. 7 DUMOULIN Tom TEAM SUNWEB s.t. 9 VAN GARDEREN Tejay BMC s.t. 5 BAUHAUS Phil TEAM SUNWEB s.t. 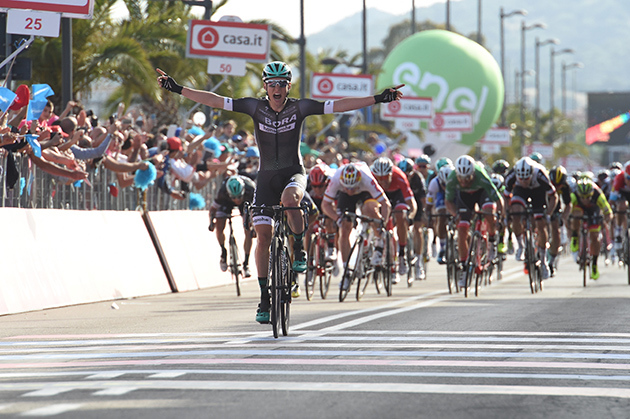 6 SBARAGLI Kristian DIMENSION DATA s.t. 7 GIBBONS Ryan DIMENSION DATA s.t. 8 FERRARI Roberto UAE TEAM EMIRATES s.t. 10 BATTAGLIN Enrico LOTTO NL-JUMBO s.t. 5 NIBALI Vincenzo BAHRAIN-MERIDA s.t. 7 QUINTANA Nairo MOVISTAR TEAM s.t. 10 AMADOR Andrey MOVISTAR TEAM s.t. Jan Polanc gets a great solo victory on Mt. Etna. 4 PINOT Thibaut FDJ s.t. 5 CATALDO Dario ASTANA s.t. 7 JUNGELS Bob QUICK-STEP FLOORS s.t. 9 LANDA MEANA Mikel SKY s.t. 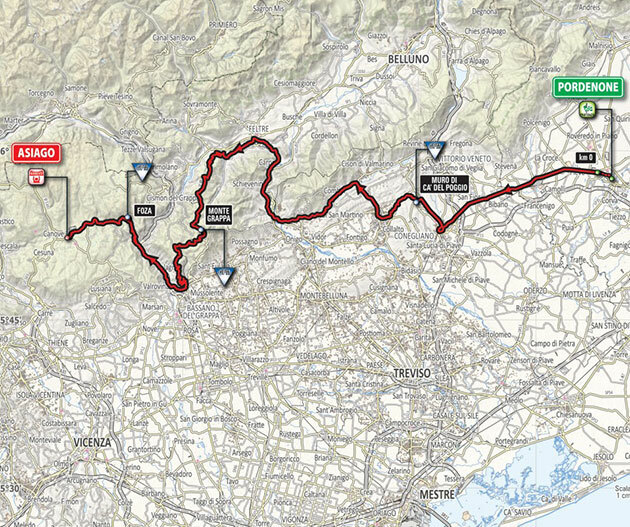 Monday, May 8: Rest Day, travel to Sicily for stage four and its finish on Mount Etna. 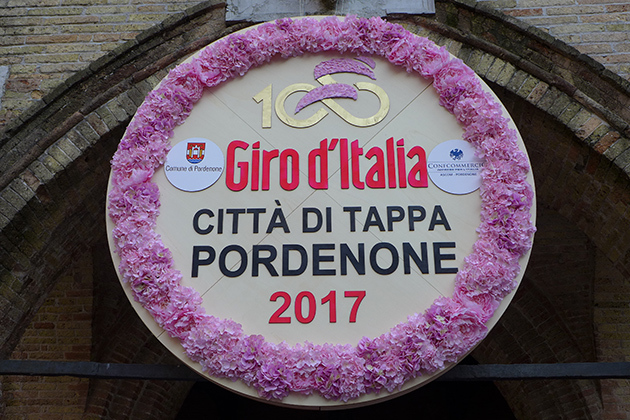 This will be the 2017 Giro's first mountaintop finish. 2 SELIG Rüdiger BORA-HANSGROHE s.t. 4 HAAS Nathan DIMENSION DATA s.t. 9 MODOLO Sacha UAE TEAM EMIRATES s.t. 10 GREIPEL Andre' LOTTO SOUDAL s.t. 4 JUNGELS Bob QUICK-STEP FLOORS s.t. 5 SIUTSOU Kanstantsin BAHRAIN-MERIDA s.t. 7 FERRARI Roberto UAE TEAM EMIRATES s.t. 9 BATTAGLIN Enrico LOTTO NL-JUMBO s.t. 10 MODOLO Sacha UAE TEAM EMIRATES s.t. 2 FERRARI Roberto UAE TEAM EMIRATES s.t. 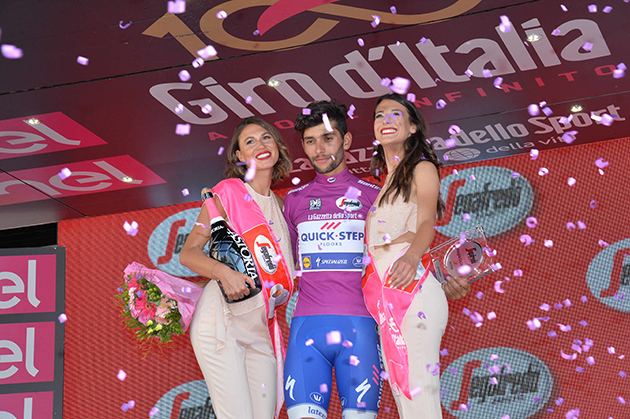 4 GAVIRIA Fernando QUICK-STEP FLOORS s.t. 5 SBARAGLI Kristian DIMENSION DATA s.t. 6 BATTAGLIN Enrico LOTTO NL-JUMBO s.t. 8 THOMAS Geraint SKY s.t. 9 EWAN Caleb ORICA-SCOTT s.t. 10 FARIA DA COSTA Rui Alberto UAE TEAM EMIRATES s.t. 8 GIBBONS Ryan DIMENSION DATA s.t. 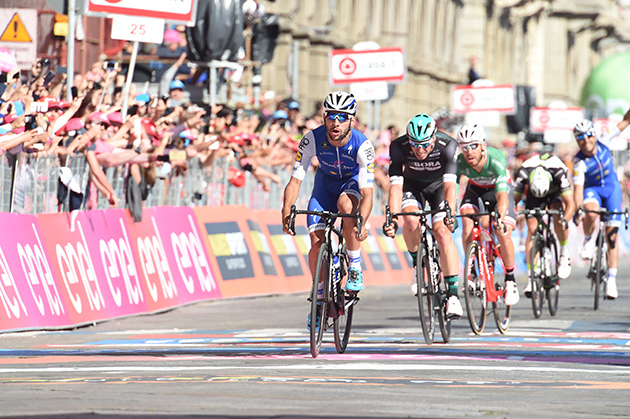 9 GAVIRIA Fernando QUICK-STEP FLOORS s.t. 2 EWAN Caleb ORICA-SCOTT s.t. 3 GREIPEL André LOTTO SOUDAL s.t. 5 MODOLO Sacha UAE TEAM EMIRATES s.t. 7 STUYVEN Jasper TREK-SEGAFREDO s.t. 9 BENNETT Sam BORA-HANSGROHE s.t. 10 BAUHAUS Phil TEAM SUNWEB s.t. 6 MODOLO Sacha UAE TEAM EMIRATES s.t. 7 SBARAGLI Kristian DIMENSION DATA s.t. 8 STUYVEN Jasper TREK-SEGAFREDO s.t. 9 GIBBONS Ryan DIMENSION DATA s.t. 10 BENNETT Sam BORA-HANSGROHE s.t.